What Comes First: The Size of the Pet or the Gazebo? It’s a simple, age-old question: which came first, the chicken or the egg? At Advantek Pet, we want to help you determine which comes first, but with your pets. Which comes first for you? The size of the pet or the gazebo? There are a few things to consider before purchasing a PET GAZEBO® or adding a new furry friend to your family. At Advantek Pet, we are developing new models to accommodate animals and their needs. 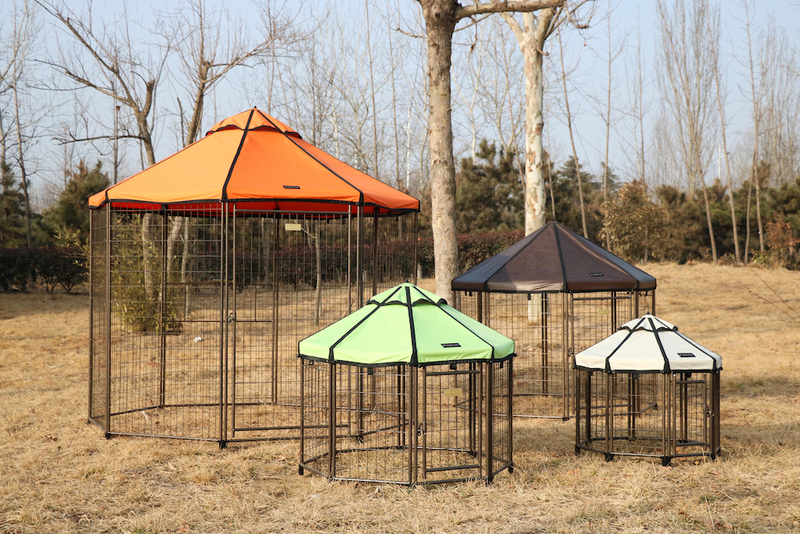 Initially, we had designated PET GAZEBO® as small, medium, and large. To help you better identify the correct size for your pet, we are now focusing on the physical size dimensions and your dog’s weight. When thinking about adding a furry friend to your family, you should consider all the expenses that come with taking care of an animal. There are several things you need, including a bed, food, toys, and a kennel to protect them from the elements in your backyard or give them a stylish place to sleep indoors. We think the size of the pet comes first because it is crucial to find an animal you connect with and love, which is why we design our PET GAZEBO® with this in mind. No matter what size your pet is, Advantek Pet has the perfect size for your pet. Sometimes our pets like to spend some time indoors. They can relax with their family, rest after visits to the vet, and stay in one space during special events so they aren’t in the way, but still have room for some puppy love and attention. A smaller PET GAZEBO® is ideal for these moments and dogs who live an indoor lifestyle. You can purchase a PET GAZEBO® for your pet’s size requirements, but also have smaller ones on hand that your pet can still fit comfortably in for sleeping, resting, or staying in one place when you have company over. The smaller kennel saves space and also gives your pet access to their own personal space indoors. Pet stores sell exercise pens, crates, and kennels with different requirements to find the right size for your animal. It can be difficult to discern which kennel will be the best fit for your pet. Most are either too confining or too simple. Choosing a size for your PET GAZEBO® is effortless because it is done by designating size and weight. It includes various features to protect your pet outdoors, such as the reversible canopy and sun shade. The PET GAZEBO® provides a stylish, comfortable place for your pets to relax in your backyard, on camping trips, and even inside your home. Interested in buying or selling our products? Learn more by visiting our website to contact us today. What are the prices on them? We are delighted to hear from you. 3-foot for pets up to 20 lbs, 4-ft for pets up to 40 lbs, 5-foot for pets up to 80 lbs, 8-ft pets up to 200 lbs. Please contact our customer service department at 800-664-4939 and they will be happy to assist with pricing for your area.